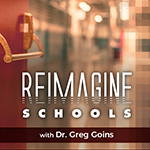 In this episode, Tom Murray, Director of Innovation for Future Ready Schools (FRS), talks about efforts to maximize digital learning opportunities to help school districts move quickly toward preparing students for success in college, a career, and citizenship. The conversation includes information on the Future Ready Pledge for school district leaders and how resources such as the FRS Framework and interactive dashboard can help lead your school to personalized learning experiences for all students, particularly those from traditionally underserved communities. Murray also talks about FRS's role as bipartisan advocates for school policy and how your school district can take part in the newly launched Future Ready Schools Film Festival in 2019. Twitter: @thomascmurray. Website: www.thomascmurray.com. www.futureready.org.